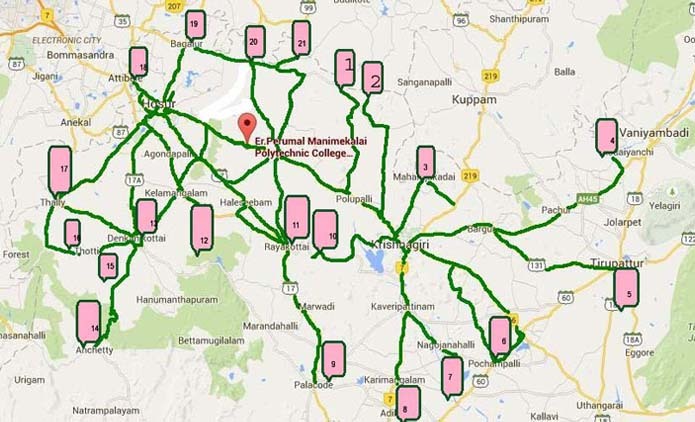 For the transportation of the day-scholar students and staff the college has 42 buses plying through every nook and corner of Hosur town and its suburbs like Krishnagiri, Kaveripatanam, Thirupathur, Jolarpet, Bagulur, Thenkanikotai etc. 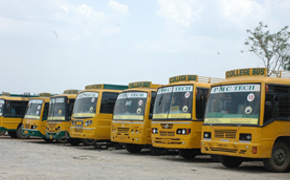 The bus routes are operated after taking into account the need of the students. 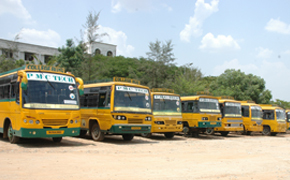 All students make use of the college transport or stay in the hostel. Private vehicles like two-wheelers and cars are not permitted, in order to prevent accidents and late-comers to college. All the buses reach the campus before 8:30 a.m. so that students and faculty can have their breakfast and get ready to attend the classes at 9:00 a.m. The buses leave the campus at 4:30 pm, which helps students to reach home early and safe. The time mentioned below is the indicative time. The Students are asked to come to the boarding point, 10 minutes before the time indicated.